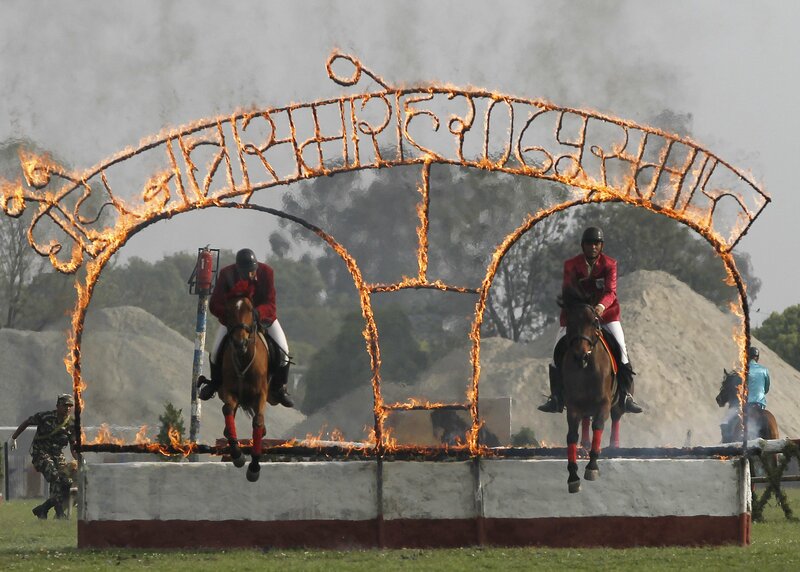 KATHMANDU, Nepal — Nepal’s president, top officials and diplomats gathered recently at army grounds in central Kathmandu for an annual horse festival that marks the slaying of the Hindu Gurumapa demon. Soldiers race the horses and show off warfare techniques believed to keep devil spirits away through the pounding of the horses’ hooves. A dedicated team of soldiers spends three months preparing the animals for the Ghode Jatra festival. According to a centuries-old tradition, people raced horses before worshipping gods with offerings of food and flowers under a tree. It has been 169 years since a Nepalese king designated the army to perform the festival rituals. At the Nepal Cavalry grounds, located on the former site of the royal palace in Kathmandu, Nepal’s capital, riders spend months bonding with the horses. There are 106 horses at the cavalry and more than 200 soldiers take care of them. Every day, the soldiers bathe, groom and feed the horses, which are raced and tested to check their skills and ability. On the day of the festival, the uniformed riders race the horses on tracks, and show off skills like picking up objects with spears while riding at high speeds. Meanwhile, the most powerful members of Nepal’s government and foreign diplomats cheer them on. A child revered as the Hindu Living Goddess Kumari is carried out of the palace temple and brought to watch the horse festival. Away from the cavalry grounds, the Newar community — an indigenous group from Kathmandu — worships the gods and feasts with friends, families and community.